Kinda late, but oh well. Wanted to listen to the album a bit more before posting about it so I had a better feel for which song was which (because musically a lot of the songs sound the same on this album, and I wasn’t familiar with every song prior to this release). 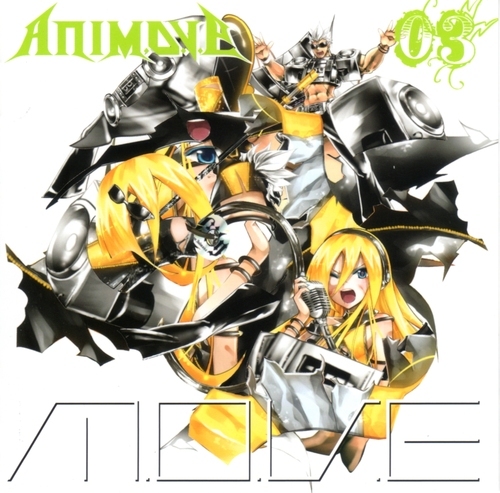 The anim.o.v.e albums collectively are great. It’s fun listening to old anime themes redone in a techo/m.o.v.e style. The covers are always really well done, so I was really looking forward to this album. The collaborations with other artists are always really cool too, but we only got one this time around, but that’s okay. That it was Yukarin makes up for it. Honestly, she’s had two collaborations with Motsu (Yukarin’s “You & Me” and “Love Sick”), and now “LOVE SHOWER” can be added to the Yukarin x m.o.v.e list. Really, their music is so polar opposite one would never expect that kind of combination to worth and yet this is the third time where it has. Haha. Might as well get it over with and add Yukarin as an official member. Haha. But I’m seriously waiting for when Nana and Minorin get featured on an anim.o.v.e album. Really hoping that happens. Haha. If not, I’d like to see “ETERNAL BLAZE” or “Paradise Lost” get covered. The ladder would be awesome as a m.o.v.e song. A cover of their 20th single and one of my favorite m.o.v.e songs. This version is just cool. The rock was replaced with synth beats, high bass, violins, and those quire singers which have a technical name I’m sure (they make any song epic). Musical differences like these are what make self-cover songs worth listening to. Speaking of, excited for ｢THE MUSEUM II｣’s “SUPER GENERATION –MUSEUM STYLE–“!! WOO! The second opening to Gundam Wing. I’m not a Gundam fan myself, but my friend is so I’d like to hear what he has to say about this version of the song. After listening to the original, this version doesn’t seem all that different. It just sounds more 2011, and that’s about it. Not necessarily bad. Having not heard the original this song became one of my favorites on the album just from hearing this version. Couldn’t help but notice that there was no Motsu though! Gasp! Future GPX Cyber Formula. Never heard of it. Is that bad? Is that like something I should know? Uh oh. Haha. Definitely more going on in the m.o.v.e version as opposed to the original song. I sort of prefer the feel of the original though. Both versions have a cool opening, but sometimes I prefer songs without Motsu (no offense), and I think his take on the beginning of the song was a bit obnoxious. I’d rather pass on this song altogether though. Onto the next one. The opening theme to Higurashi no Naku Koro ni Kai. I really need to watch the Higurashi series. It looks really good and I’ve heard so much awesome about it. The original song is by Shimamiya Eiko, whom I never really looked into despite loving three other I’ve Sound members. But really, I could tell the song was produced by I’ve Sound even if I didn’t know the singer; kind of a typical trance song that you’d hear from them. Haha. Anyway, the original is better, more haunting, but the m.o.v.e version is pretty good too. I don’t think the m.o.v.e version pulls off the same mood that the original conveys though. It’s actually a pretty different version. Interesting song choice, m.o.v.e. The opening of another anime I’ve never heard of: Dennou Coil. The original is by Ikedo Ayako, who from hearing her sing this song I can conclude has a really, really nice voice. No offense to Yuri, but it’s because of this that I have to say i like the original better. Contrary to the previous song though, this version managed to keep the mood of the original song in tact. The song itself is rather slow for a m.o.v.e song, and it’s a bit puzzling why this song was chosen. I don’t know. m.o.v.e does better with fast-paced songs in general. I mean, if I was to name one slower-paced song in their discography off the top of my head I might only be able to name “Nobody Reason~Noa no Hakobune”. A good version nonetheless. The Eureka Seven opening by FLOW. I’m not a FLOW fan, but they do have some gems in their discography: “COLORS” being my favorite, and “DAYS” is definitely one of them. I really, really like Yuri in the chorus. In terms of pace and overall how much I like the cover, this song is akin to “DREAMS” on ｢anim.o.v.e 02｣. Motsu’s rap was excellent. This has to be the first song that they’ve covered that actually has a rap in the original. Haha. A great, great version. Great job by both Yuri and Motsu. When I saw this song on the tracklist I freaked out. Honestly, I want to love the original of this song much more than I do. Something about Nanjo Yoshino’s voice really turns me off, though (and every single since she joined fripSide has sounded the same to me). Oh well. I’ll take Yuri because the cover of this song is fantastic. It sounds like it could be a m.o.v.e song itself. Great song choice here. Matching Yuri’s voice this version has lower-sounding synths and heavier beats than the lighter original. I really like it! No way! What’s with the odd song choices on this album! I would have NEVER expected m.o.v.e to cover this song, let alone any One Piece theme, but wow is this great! Very different from their usual stuff. Yuri sounds so nice here, really natural, and the fun feeling of the original still remains. In my opinion, this is the best cover on the album. Yet another anime I really have no idea about: Gunparde Ochestra. Hokay. Really not the strongest ending to an album. The placement was wrong; this song should’ve been up with “Prism”. But really, I think there were too many of these slower-paced songs on the album. I don’t think m.o.v.e should be covering ballads, but alright. The song’s a bit boring. This entry was posted in m.o.v.e, Reviews and tagged m.o.v.e. Bookmark the permalink.